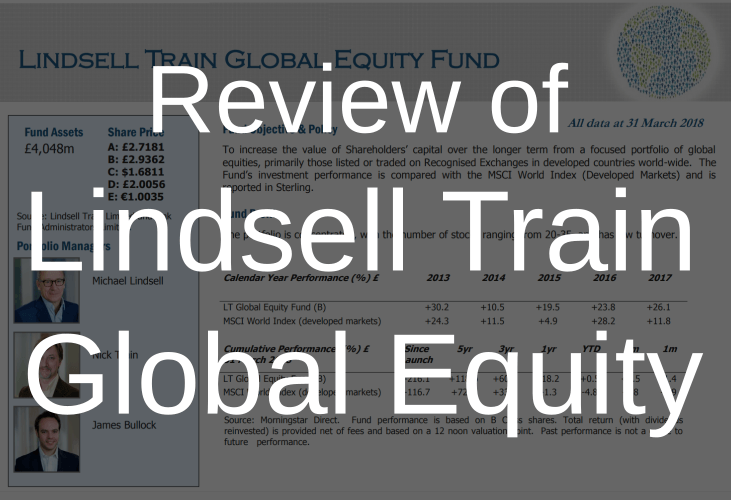 Lindsell Train Global Equity is an extremely popular investment fund that is drawing in capital thanks to its strong performance. Here we delve into its approach to investment, the risks it is taking to generate those strong returns and whether that outperformance can continue. The name of the fund comes from the two founders of the company Michael Lindsell and Nick Train. Lindsell has an undergraduate degree in Zoology from Bristol University and Train has an undergraduate degree in Modern History from Oxford. Both used to work for a fund management company called GT Asset Management which was bought by Invesco in 1998. Lindsell became head of the combined global product team after the acquisition and Train resigned and took up a role as head of Global Equities at M&G Investment Management. They co-founded Lindsell Train in 2000. The third portfolio manager running this fund is James Bullock who has a Masters degree in Physics from Oxford and a doctorate in Biomechanics from Cambridge. He was promoted to Portfolio Manager in April 2015. "Our primary aim is to protect the real value of our clients’ capital over the long term. This is consistent with one of our key business principles, which calls us to invest our clients’ capital as we do our own (indeed the founders invest alongside clients in all the strategies). As individual investors, we care about maintaining or growing the real value of our capital and income over time; for us, outperforming a given equity index, or failing to, is of secondary importance." Saying that capital preservation is the primary aim is a fairly unusual marketing message for an equity fund. After all, cash is a much safer way of preserving capital than investing in shares which are notoriously volatile and given to market crashes. Investors buy share funds to grow their capital with the full knowledge that they take a high risk of capital loss, so this seems an odd primary aim. It's good to see that they invest their own money in their funds so that they have "skin in the game". Fund managers should be willing to eat their own cooking. Lindsell Train say that they care about capital growth as well as capital preservation. In fact, they see outperforming an equity index as less important than capital growth. As an aside, before the financial crisis lots of funds were branded as "pure alpha" i.e. in a market crash they would not follow the general market down. Sadly almost all the "pure alpha" funds turned out to have quite a bit of market-tracking "beta" thrown in and many of them were forced to close or re-brand themselves following the crash. Fortunately, they don't claim to be impervious to losses in the event of market crashes. These are all sensible things to say and adhere to the "fundamental investor" philosophy of finding companies with a strong business model that will return capital to investors via capital growth and income via dividends. The legally required Key Investor Information Document, shown above for the class A shares, also points out that the fund "may not be appropriate for investors who plan to withdraw their money within five years". While returns have been good during the global market rally this is a 100% equity fund. If there is a global fall in stock markets, as has happened regularly in the past, this fund will also fall in value. To get the best results out of any fund you have to be in it for the long-term and that means not selling even if stock markets fall. By taking a long-term view you can look through periods of volatility. A refreshing difference between Lindsell Train Global Equity and other global equity funds is its 20% allocation to Japanese shares. Usually global funds have a very large US allocation which reflects the fact that the US equity market is 40% of the global market. 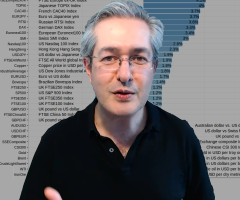 Michael Lindsell has a great deal of knowledge about the Japanese share market, having invested there for most of his career. For example, at Mercury Asset Management he was director and head of Japanese fund management in London, at Scimitar Asset Management in Hong Kong he ran Pacific and Japanese mandates and when he was Chief Investment Officer of GT Asset Management he was based in their Tokyo office. The portfolio is concentrated in just four Developed World countries: the US, UK, Japan and the Netherlands. One consequence of this geographic allocation if you are a UK based sterling investor is that you will be exposed to the strength of sterling to the US dollar, Japanese yen and to a lesser extent, the euro. If sterling weakens versus any of those currencies the fund will gain in value and if sterling strengthens the fund will lose value. Looking at the top 10 holdings in the portfolio in April 2018 shows that this handful of stocks makes up about 60% of their portfolio. While these are very carefully selected stocks which have successfully beaten the broader market so far this raises concerns about concentration risk which we discuss below. By durable they mean long-lived brands. In an interview on YouTube Nick Train says that if possible they like brands that have been around for decades, if not centuries. Well we've got a really clear set of criteria that we're looking for for potential investments, essentially we're looking to identify companies with brands or franchises that have been around for a long long time, decades, or actually preferably brands that have been around for centuries. As well as having a strong past Lindsell Train wants companies that they believe will have a strong future. At the same time we want to believe that those brands or franchises are going to remain relevant for decades and maybe even centuries into the future, and truth is that there just aren't that many companies (that we can identify anyway) all around the world that meet those sort of criteria of longevity and sustainability into the future. Just to put some numbers on this, in our global research database I think we've got about a hundred and seventy five companies only. Lindsell Train invest in companies owning "valuable and unique intellectual property whether it be brands, content or marketplaces". These are usually in just a handful of industry sectors: Consumer Branded Goods, Internet/Media/Software, Pharmaceuticals and Financials. They build a theoretical model of the value of a company using "a variety of approaches, the most important being a discounted cash flow calculation". This involves making an educated guess about how much revenue and profit each company will generate in future and then adding up the value of those cash flows, discounted using another educated guess about future interest rates. These models, if correct, indicate whether a company is fairly priced, expensive or cheap. "Concentration" means buying just a few stocks. Lindsell Train tend to hold between 20 to 35 stocks at any time so their portfolio is highly concentrated. The way they generate high returns is by dialling up this so-called "concentration risk". If you had perfect knowledge of the future and you were to choose such a small number of stocks that would definitely outperform Lindsell Train's statement that "concentration can reduce risk" would be true. However, Lindsell Train do not have perfect knowledge of the future and so this statement is simply false. Concentration always increases risk because it reduces diversification. The unseen always happens: accounting fraud, natural disasters, disruptive technology, trade wars... and concentration means some stocks and sectors will be hit in an unpredictable way. Lindsell Train stick with their bets once they have found companies they like. This is great because it means less transaction costs paid to their brokers and ultimately this drag on performance is avoided for their investors. Once we have committed to a company we are extremely reluctant to sell it, except on a significant breach of our valuation target or when we realise that the premise for the investment is no longer valid. This reflects our conviction that owning great companies for the long haul makes sense and that transaction costs are a tax on our clients’ capital, a tax that we cannot avoid altogether, but that we can minimize by dealing as infrequently as possible. The percentage of their portfolio that they change each year is very small. On their website they say that it is generally less than 5% each year. The fee that you pay depends on the share class that you buy and the investment platform on which you hold the fund. Assuming no discounts, the A class shares come with a high annual ongoing charge of 1.24%, the class B shares have a much lower ongoing charge of 0.74% and the D class ongoing charge is 0.54%. According to MorningStar the amounts invested in the three sterling denominated share classes reflect the ongoing expenses: A £526 million, B £1,325 million, D £2,272 million. 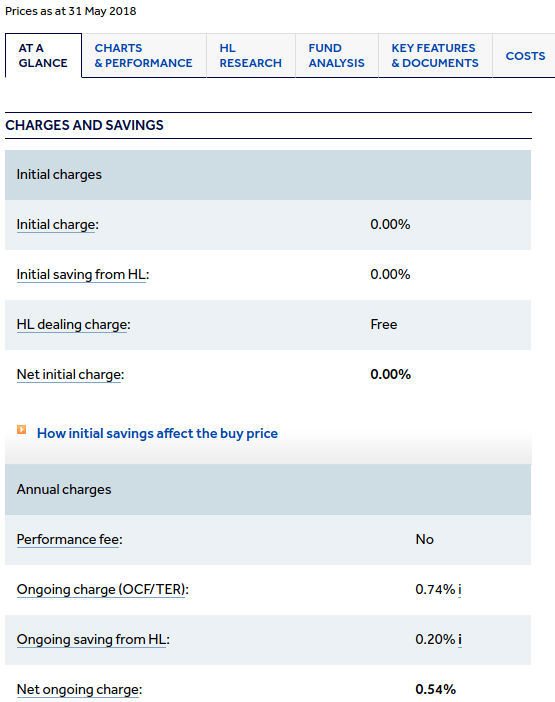 Hargreaves Lansdown says on its website that you get a 0.2% discount on the D class shares bringing the net ongoing charge down from 0.74% to 0.54%. However, on the Lindsell Train website the ongoing fee is given as 0.54% without any discount. Hargreaves Lansdown also sells A class shares, which usually have a fee of 1.24%, and offers a discount of 0.5% bringing the ongoing fee down to 0.74%. Fidelity: Offers the B share class for an ongoing charge of 0.74%. Barclays SmartInvestor: Offers the B share class for an ongoing charge of 0.74%. 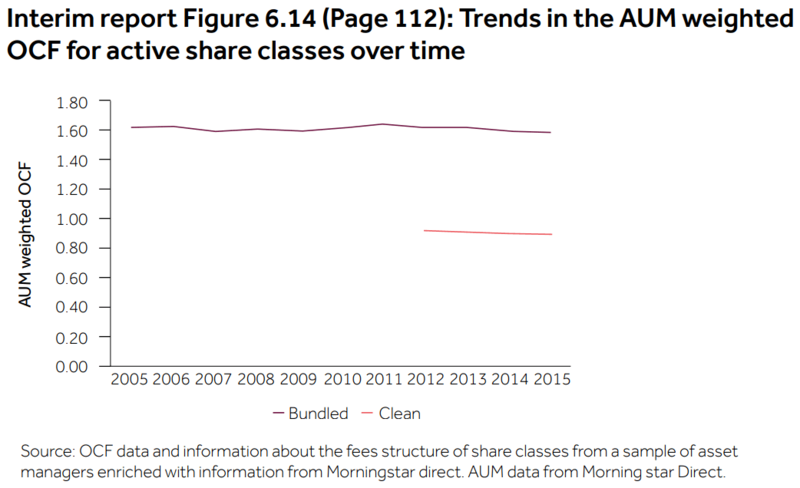 This is how the fees appear on the Hargreaves Lansdown website for the D share class. The Wealth 150+ is a selection of our favourite actively managed and tracker funds across the major investment sectors. For a fund to be selected it must pass a rigorous selection process, and we continually monitor the list to ensure it contains only the best funds. We believe Wealth 150+ funds offer the ultimate combination of first-class performance potential and low management charges. In many cases these super-low charges are only available through the Vantage Service - a unique benefit to Hargreaves Lansdown clients. Hargreaves Lansdown is clearly promoting Lindsell Train funds on its website, highlighting the discount provided when purchasing their funds on the Hargreaves Lansdown platform. It's also worth mentioning that at the time of writing Lindsell Train currently has a holding in Hargreaves Lansdown. This may create a conflict of interest when assessing whether Hargreaves Lansdown should promote Lindsell Train funds by including them on its Wealth 150+ fund list. To put these fees in context, bear in mind that this is an active fund. The goal of an active fund is to skillfully choose stocks that beat returns of the whole stock market. The market it's trying to beat is called the benchmark and in the case of Lindsell Train the benchmark is a stock index called the MSCI Developed World Index. This benchmark is like owning a huge portfolio of about 85% of all Developed World stock markets. The Financial Conduct Authority has done a review of asset managers, published in 2017, which found that the average fee (Ongoing Charges Figure) was 1.6% per year. This figure has not fallen, unlike passive funds where fees have fallen dramatically over recent years. 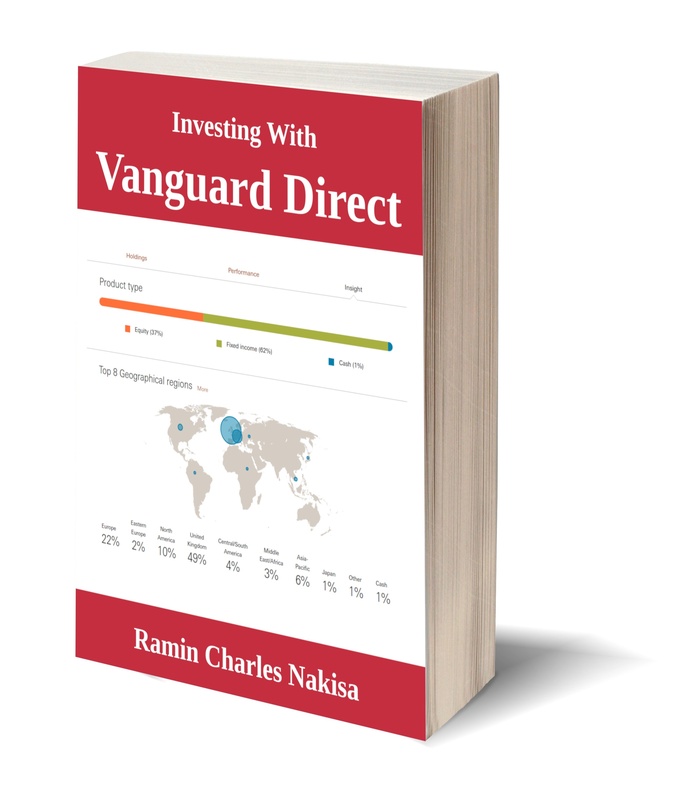 A typical passive fund would charge around 0.2% to 0.3% per year with the cheapest charging as little as 0.07% per year. In this context Lindsell Train Global Equity is by no means the most expensive active fund out there. The price you pay will depend on your investment platform, and so if you are going to make a large investment in the fund it certainly pays to find out which platform will offer you the best deal. For example, if you go with Hargreaves Lansdown as an investment platform you will pay a relatively large annual platform fee, currently 0.45% per year. Although you would be paying 0.2% less for your Lindsell Train fund you will pay more for your entire portfolio than you would with other platforms. In addition to buying share classes of Lindsell Train funds, which also include a UK Equity Fund and a Japanese Equity Fund, you can buy a slice of the investment company. This is structured as an investment trust and provides a way to gauge the popularity of Lindsell Train as an asset management company. An investment trust is a company that invests a pool of money on behalf of its investors and which itself trades its shares on the London Stock Exchange. The value of the investment trust's pool of investments is called the Net Asset Value (NAV). However the price of shares in the investment trust can deviate far above and below Net Asset Value. Lindsell Train is unusual in that shares in the investment trust have almost always traded above Net Asset Value. This is a vote of confidence in the company. 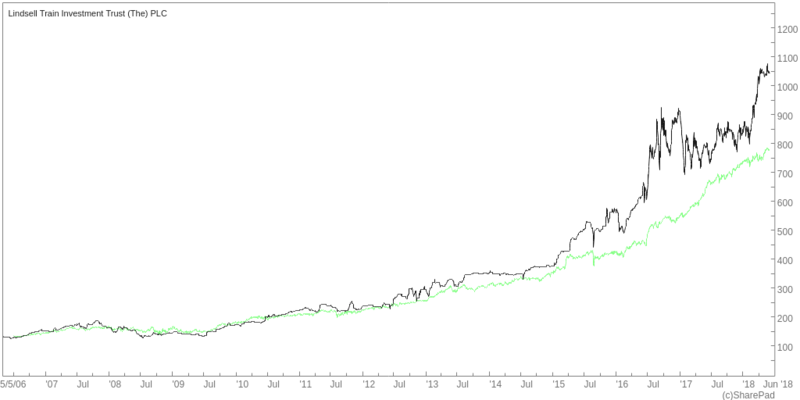 In the graph below the green line is NAV and the black line is the price of the Lindsell Train Investment Trust. The "normal" situation is for a fund to hover close to its NAV so it may be that Lindsell Train Investment Trust is currently overvalued and that it will "mean revert". What is certainly true is that making a profit on the investment trust at the moment faces headwinds because either NAV would have to increase significantly as the value of the funds increases or the premium to NAV would have to increase beyond the currently very high levels. 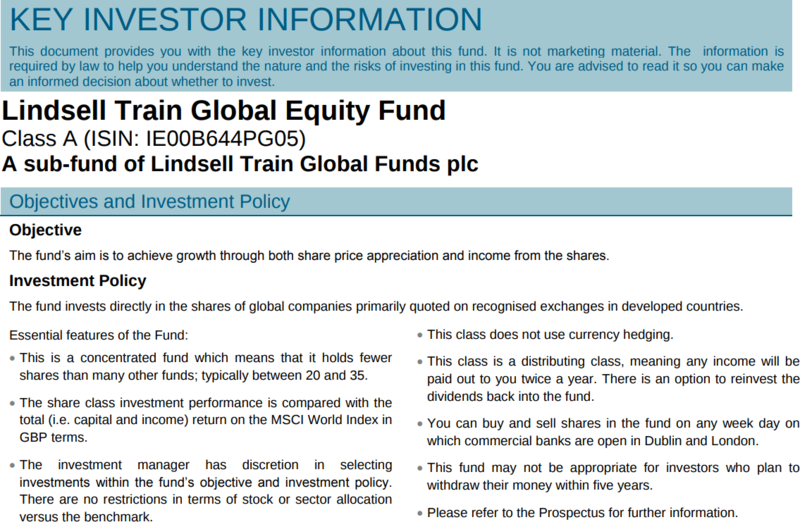 One reason why Lindsell Train Investment Trust may be so expensive is that it holds a large stake in Lindsell Train Limited, the fund management company co-owned by Michael Lindsell and Nick Train. If this sounds complicated, it is, and makes it very difficult to come up with a value for the investment trust. However with such a high premium there is a risk that the bubble may burst, as investors flock to the next exciting fund to come along. The reason why Lindsell Train is so popular is because of its strong performance. There is a tendency for fund investors to pour money into funds which have performed well with the expectation, contrary to a great deal of evidence, that this outperformance will continue. The performance of Lindsell Train has been strong against its benchmark the MSCI World Index denominated in sterling. 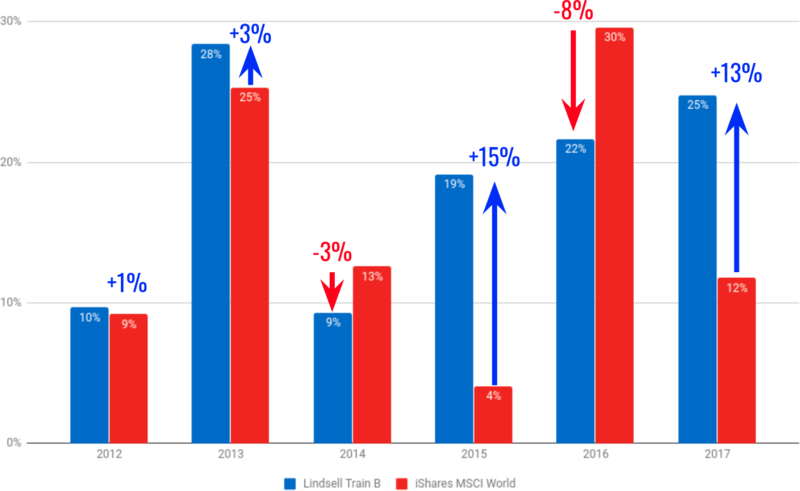 For comparison below we show Lindsell Train's B share class versus a very popular MSCI World Index tracking fund managed by Blackrock (ticker SWDA). This shows that from 2012 to 2017 there were some bad years (2012 +1%, 2014 -3%, 2016 -8%) but some years with very large outperformance (2015 +15% and 2017 +13%). 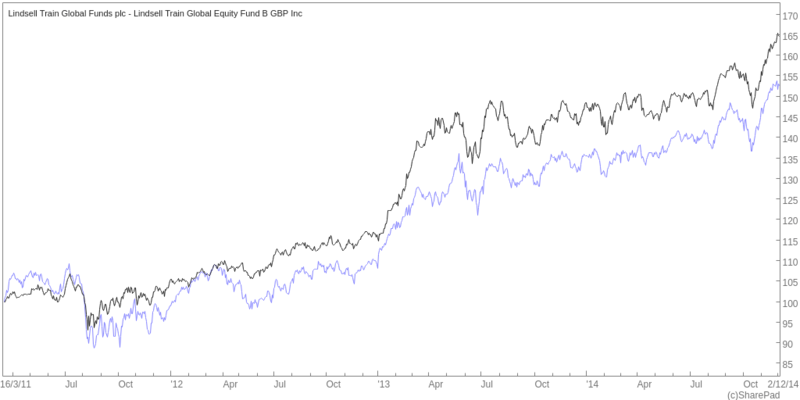 For the first three and a half years of its existence the Global Equity Fund's performance was far from spectacular. This is the B share class versus the MSCI World tracker SWDA, and you could be forgiven for dismissing this fund as mediocre. This begs the question of what has driven the recent outperformance and whether that outperformance can continue. It is possible that by choosing a highly concentrated portfolio of stocks Lindsell Train has been lucky. The period since 2011 has been a very positive one for equities and it may be that the factors behind Lindsell Train's stock selections have been in favour in this environment. It may be that these stocks fall out of favour in future. Looking at the entire history since 2011 to the time of writing in June 2018 we can see the effect of the periods of strong outperformance in 2015 and 2017. These two periods are primarily responsible for the divergence of the fund from its benchmark. In contrast the years where there was underperformance versus the benchmark, such as 2016, the size of underperformance was smaller than the size of outperformance in bumper years. It pays to remember that the baseline odds of any fund outperforming long-term are extremely low. The S&P Persistence Scorecard is based on US Mutual Funds and shows that being in the top 25% of funds in a given year almost guarantees, with 99% certainty, that the fund won't be in the top 25% of funds five years later. This means long-term outperformance cannot be predicted by outperformance today. In turn that suggests that outperformance is due to luck, not skill. Three quarters of UK funds investing in UK companies tracked over a decade failed to beat their benchmark when fees were subtracted from their returns. For UK Global equity funds the odds are even worse, with just one in twenty funds (5%) beating their benchmark over a decade. This is evidence from the extensive S&P Index Versus Active (SPIVA) survey. The longer the time period over which the survey looks the lower the performance as we highlight in the infographic below. This is strong evidence that for the vast majority of funds past performance is a poor predictor of future performance. 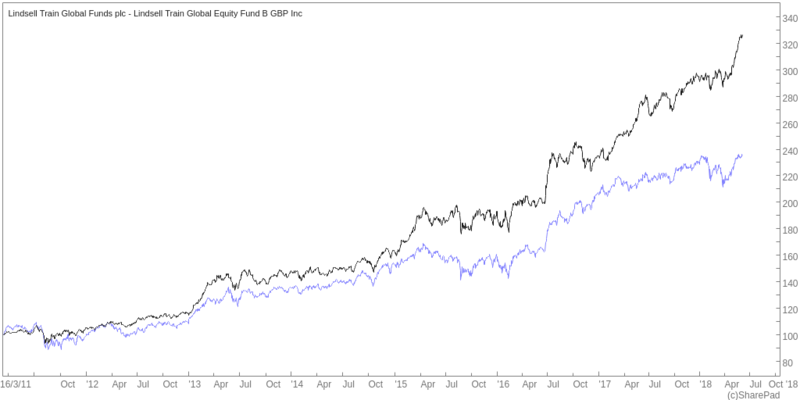 However it does leave open the possibility, albeit unlikely, that Lindsell Train Global equity might be one of the 5% of UK Global Equity funds that outperform over the long-term. Lindsell Train Global Equity is a fund that adheres to its investment philosophy which is based on companies with a strong and well-established brand, preferably with valuable and unique intellectual property and strong balance sheets. This philosophy is clearly laid out on their website and in public interviews. Once they find a stock that meets their stringent criteria they stick with it, hence the low turnover of their portfolio. The fund's popularity stems from a combination of strong performance versus its benchmark and promotion via the Hargreaves Lansdown Wealth 150 list. We doubt that the strong performance seen in 2015 and 2017 is conclusive evidence that the fund will outperform in future. However, if you believe that active managers in general, and this investment team in particular, are capable of beating the market then Lindsell Train Global equity ticks many of the right boxes.